Maaji’s Hidden Valley Signature Bottom features mixed prints both floral and stripes. 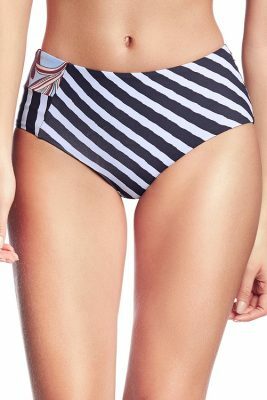 Low-rise bikini design with stripes in front. Soft bands over hips in floral print as well as at the back. Fully lined. Reverses to contrasting print for two completely different looks in one. Provides moderate with a bit of cheeky coverage as pictured. Mix and Match with Hidden Valley Fixed Halter Top and Gimme Brigadeiros Bralette Top.